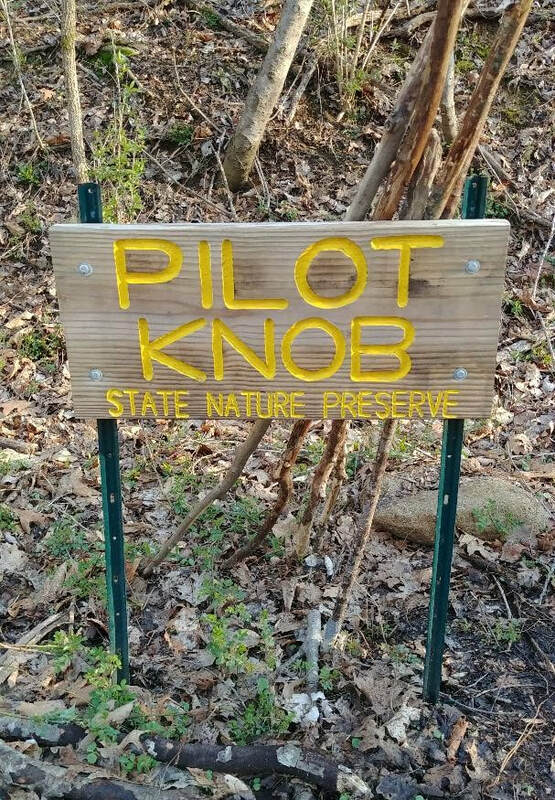 Pilot Knob is a trail that I hike at least once a year. The view is absolutely stunning and definitely a must in the fall! 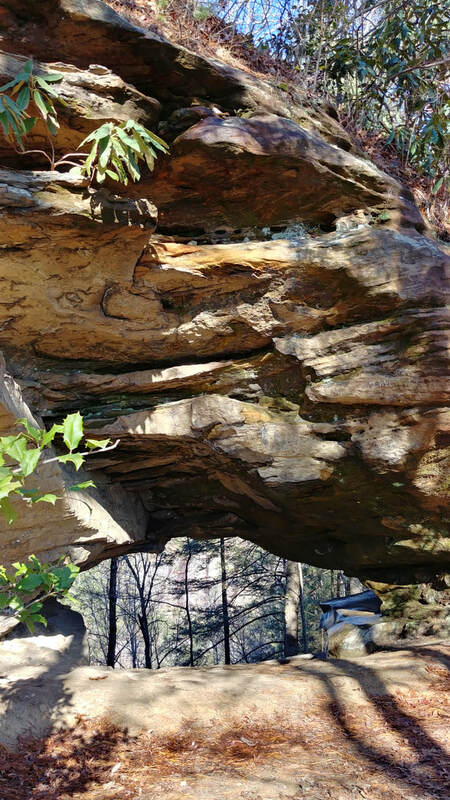 If you are a history buff, it is believed that Daniel Boone stood on this rock and looked out at our beautiful Bluegrass scenery here in Powell County. I will warn you, though...this trail is hard. Not because of crazy knee killer steps or dangerous rock climbing. But simply because the entire trail to the lookout is uphill. When I ask my family if they want to go with me, no matter the season or weather, the answer is always a very firm...NO WAY! So this time I decided to bring Ranger, the puppy dog. Seeing that he crashed without moving for 4 hours after we got home, I'm pretty sure the next time I go, he will run the other way and bark a big NO WAY, too. If you are not familiar with the location, take exit 16 off the Mountain Parkway and follow KY 15 north, towards Winchester, for 2.7 miles. Turn right on Brush Creek Road and travel 1.5 miles to the end of the road which turns into a gravel parking lot. Once you cross the creek, go thru the fence row/gate pictured above. 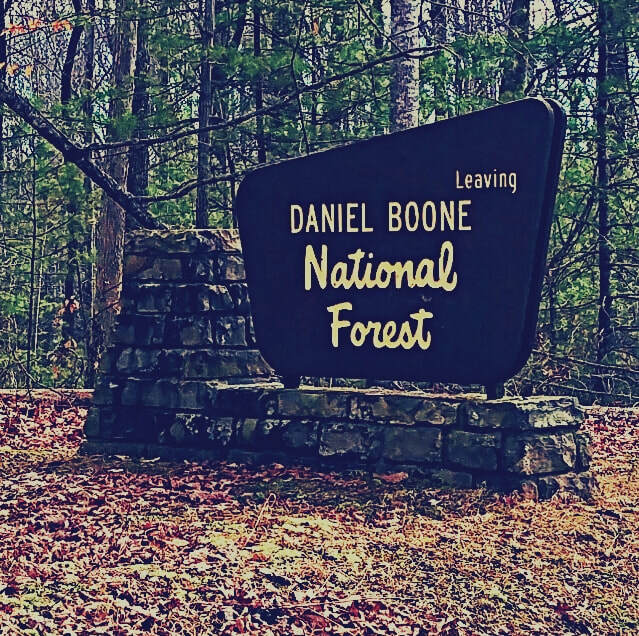 You will soon come to an area that has a map and a sign-in box which should have brochures that not only tell about Daniel Boone being here but also the history behind the short Millstone Quarry Trail that is there also. 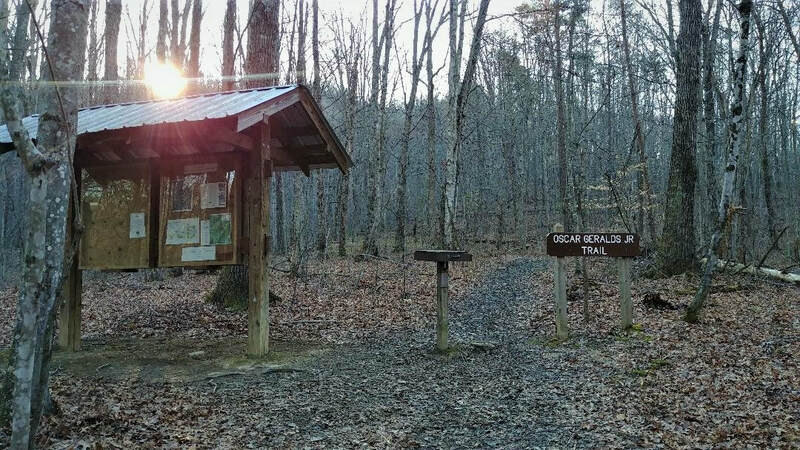 As you start the climb you will notice that the trail is very well maintained and the signage is great. But I did see rebar sticking up in a few places. Usually where there used to be a step. So be careful not to trip! You will notice about half way up, the trail turns from dirt to little pebbles. The very first time I hiked this, years ago, I wondered why in the world people hauled gravel up here?? Well, as I kept going I noticed that the huge boulders were not the normal solid rock boulders. When you look closer, you will see that they are made up of these small pebbles. Also known as Pennsylvania sandstone. From what I read, this is a treat for geology buffs. By now, though, I am huffing and puffing and taking quite a few breaks looking at the wildflowers and today, watching the two deer Ranger and I scared up. As I am rounding a curve in the trail and obviously gaining altitude, the wind picks up and I know that I am getting close to an amazing view. 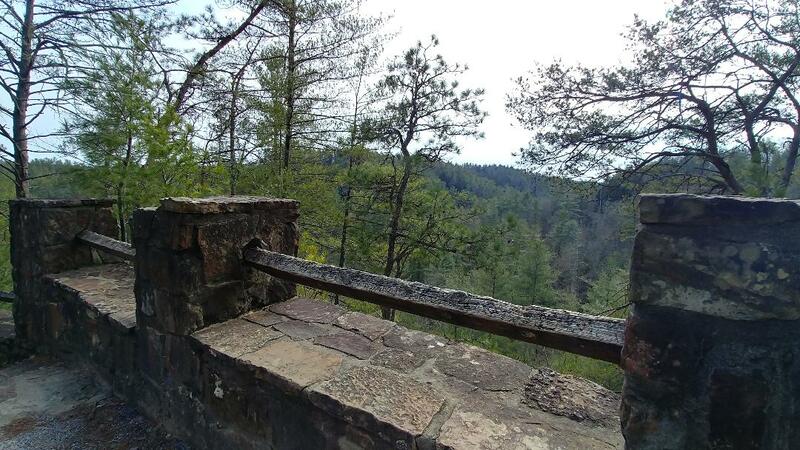 You can make a stop at an overlook that is just a small distance from the main spot only to give you a small taste of what you are about to see. Or you can walk right on by and get to the main attraction. Get ready for a view not everyone gets to see! The picture above was supposed a 360 panoramic view, but it is only allowing me to show it as a regular pano pic. Bummer! Well, you know what this means? You just have to get out and take this hike so you can see exactly why I love this trail and this view! I always take a snack and water and sit right down and try to see as far as I can see...watch the birds fly right in front of me...take lots of pictures and just enjoy the peace and quiet. Trust me...you will be glad you went. The view it totally worth it. 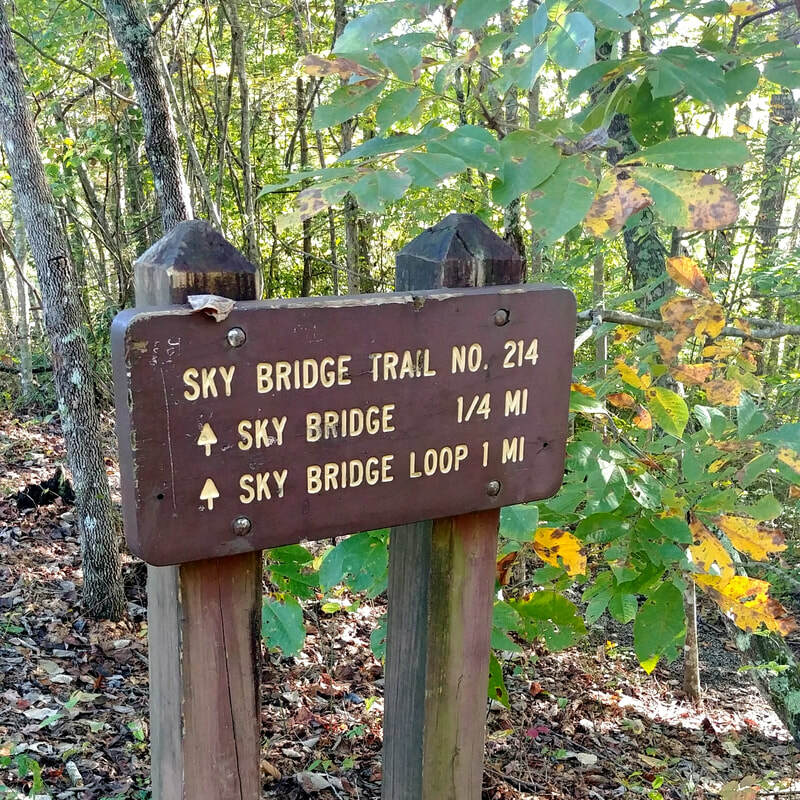 I was really wanting to get outdoors and breathe in the crisp, morning air but could not decide on which trail to hike. I had about 3 hours open in my schedule so I knew I could go on a decent, cardio filled walk. After looking at the maps and wanting to make sure I would stay within my time-frame, I chose to do the DB Hut trail. It is actually one of my favorites. 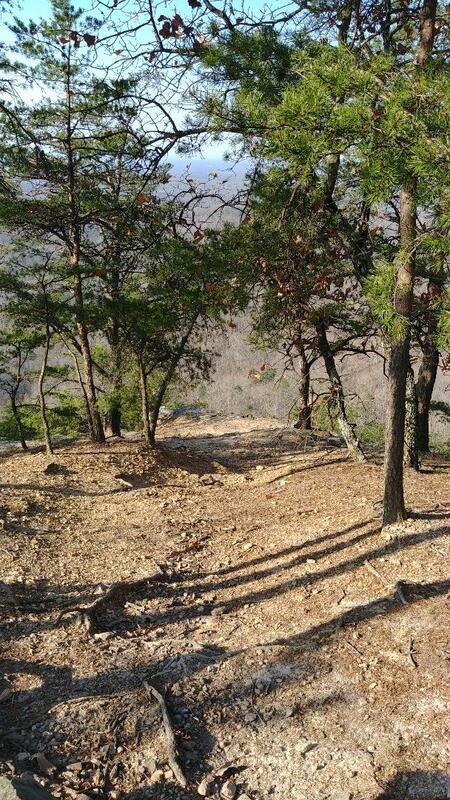 I guess maybe because this was the very first trail we hiked when we moved to Kentucky 12 years ago?? Or maybe because it runs beside a stream for quite awhile so I get to hear its lovely, relaxing sound?? Which, by the way, is wonderful when you have kiddos with you! During the hot summer days they can easily play in it and cool off. Also, the doggies can take a dip and have all the water they need. But it is a well- worn path so I'm thinking I am not the only one that really enjoys it. 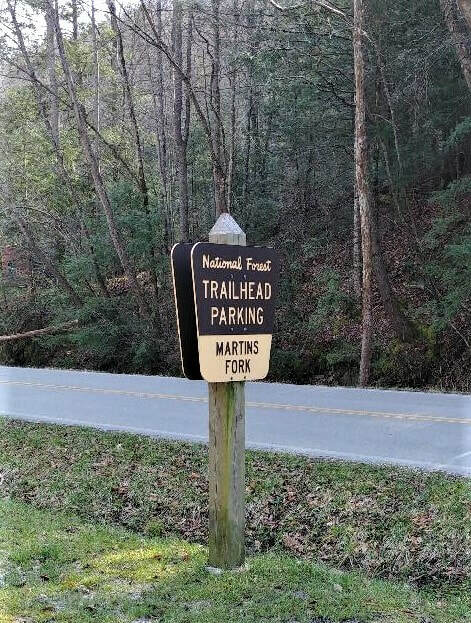 I always get to this trail by parking at the Martin's Fork parking lot. Once you cross the road, you will see this lovely little stream I am talking about. It can get muddy in areas, so put those hiking boots to good use. 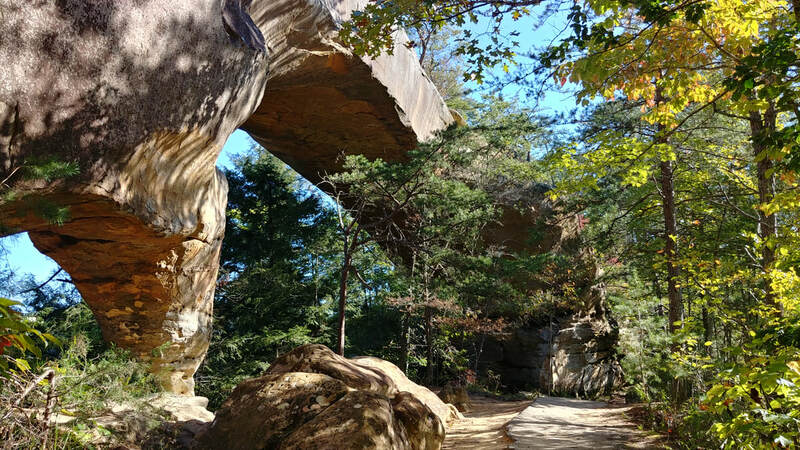 But thanks to the US Forest Service-Daniel Boone National Forest Forestry Tech, Charlie Rowe, we have wonderfully built bridges that not only provide a dry path for us, but also look pretty amazing. I did lose count of how many I crossed on this trail, but seriously, who cares. Bridges are fun! 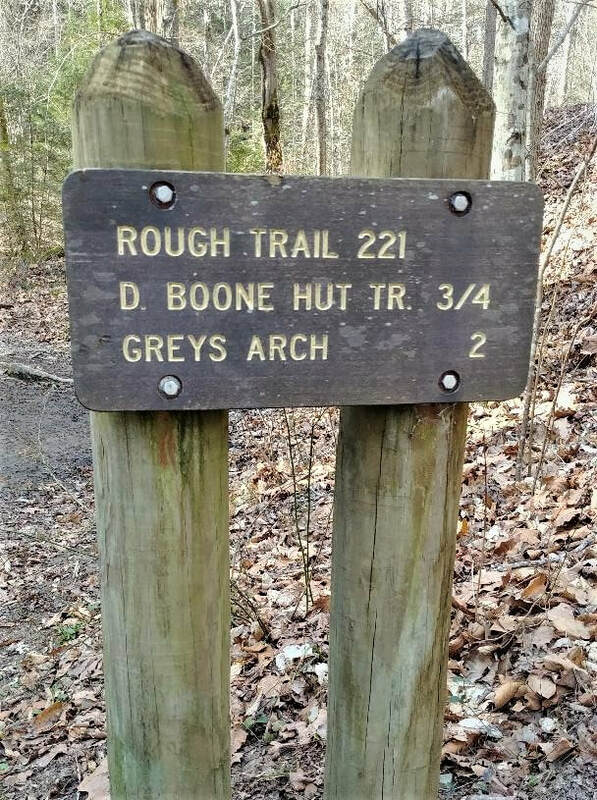 This is actually Rough Trail which takes you to the trail-head of the Daniel Boone Hut trail. When you reach this point, it takes a pretty drastic change and can be very difficult in places. Needing to duck/squat under a log...shimmy down narrow parts...big knee bend steps...just to name a few. But the end is worth it! And during the rainy season you will even get to enjoy a waterfall! 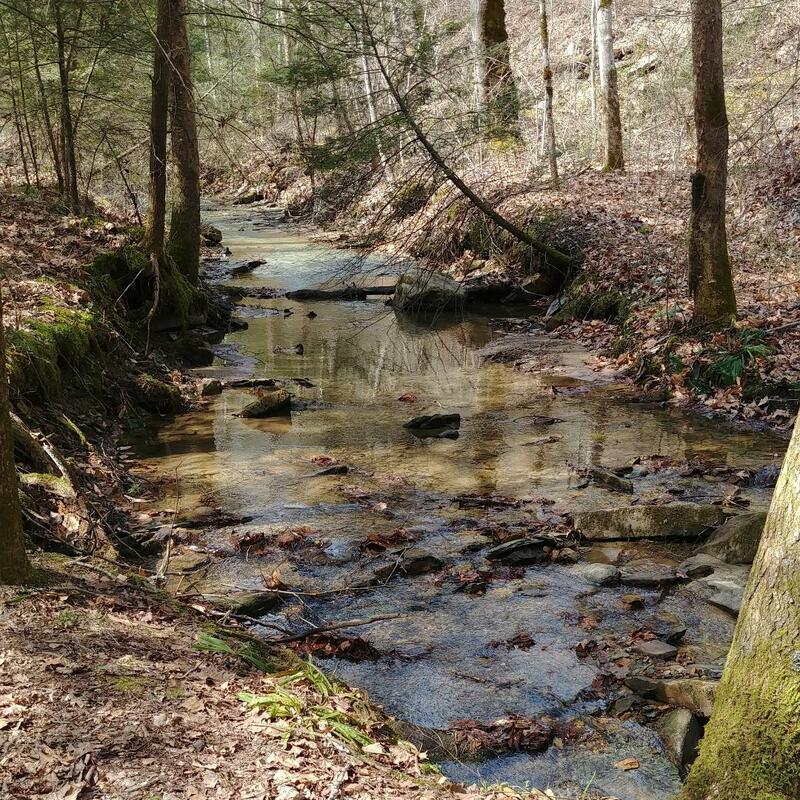 So hopefully you will be able to enjoy this lovely, spring weather and get out to hike! Get that camera ready, have fun and be safe! As I contemplated on getting housework done or go hiking, I get an email that says the Rock Bridge Road was OPEN! So that settled that! I grabbed my backpack and put all the day-hike goodies in while my husband got Ranger, the puppy, all hooked up. And then we were off! We decided to drive around to the other side of the picnic area and start the loop trail there. Now that we did it, though, I would suggest starting on the other side and go DOWN all those steps instead of having to come UP them. Shew! I forgot all about those stairs. This trail is actually paved, but very worn. It makes for easy walking, but in some areas the edges are pretty rough. So be cautious and hopefully you won't twist an ankle. Whatever side you decide to start from, you will see some beautiful views of the gorge. The trail itself is very pretty. Even when the leaves are off, there is just a beauty to it. Ranger wanted to be in the picture. 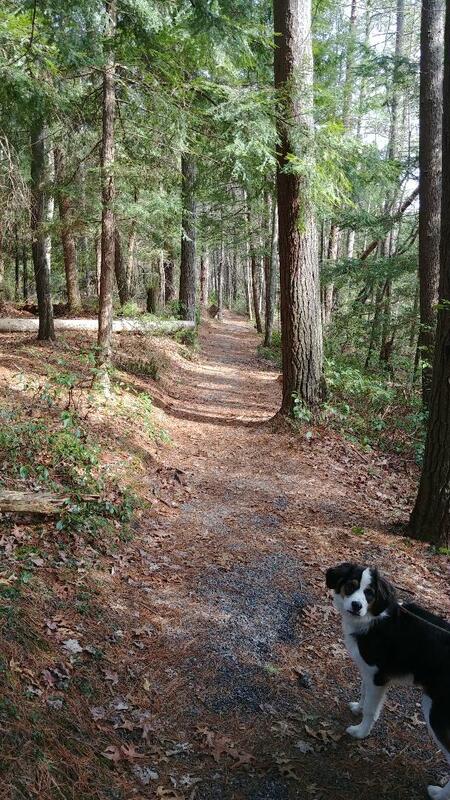 As we continued on the path, and the steps, we couldn't help but notice all the woodsy smells and sounds. Then came the sound of the small but spectacular Creation Falls. 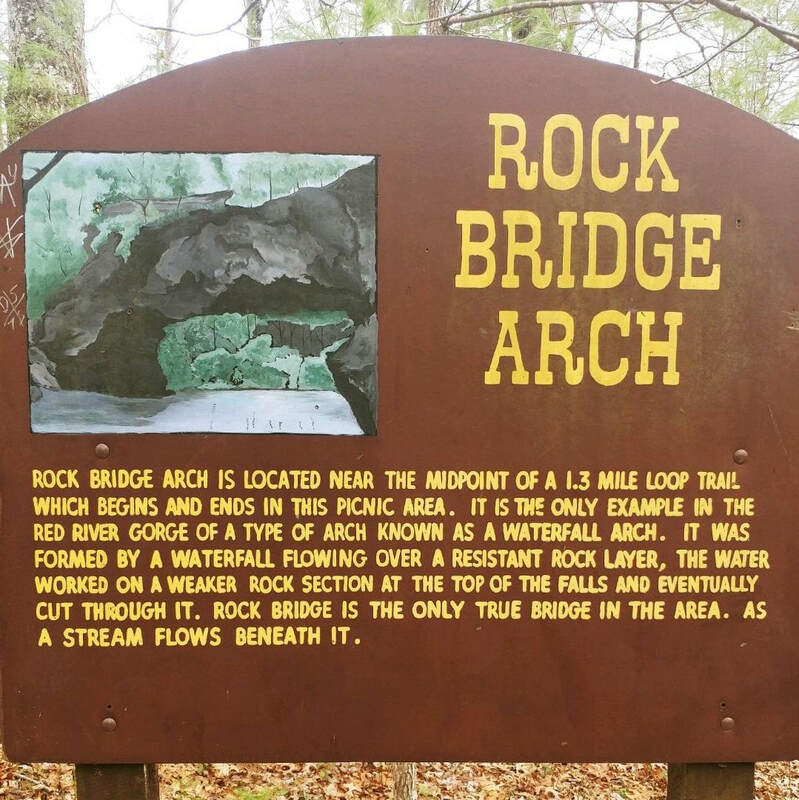 This is also where you will find Rock Bridge. As the sign states, this is the only bridge that has water running under it. This makes for a wonderful spot for a picnic. When it gets warmer this is also a nice area to take those shoes off and wade around in the shallow, sparkling water. 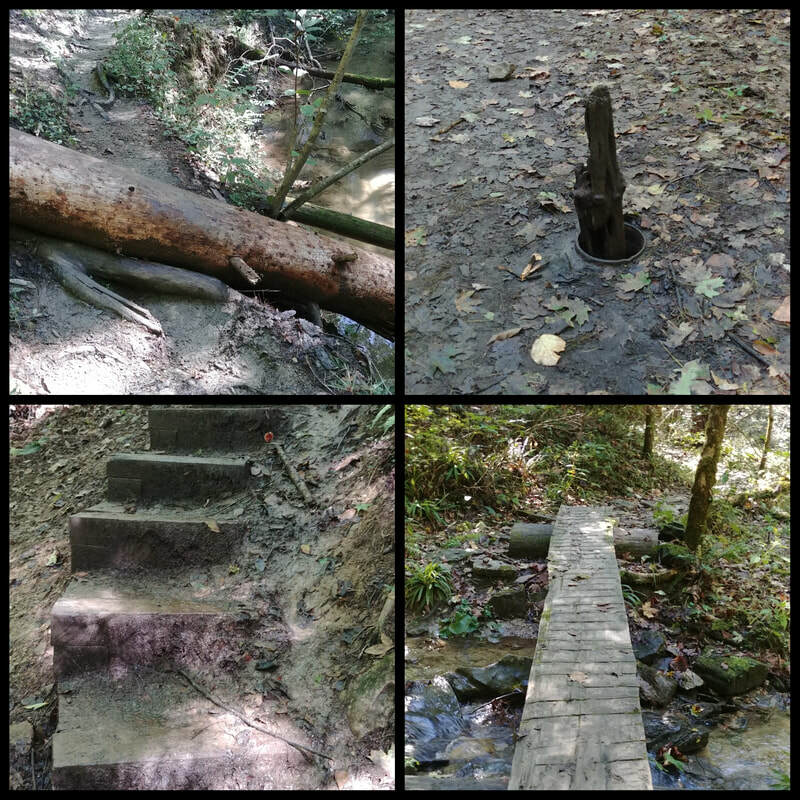 This is a fairly easy trail but with the many, many steps/stairs I decided to label it moderate. Now, if you are wanting to only see the falls and the bridge, go to the other entrance, around to the other side of the parking area. This is the shorter, quicker path. Either way, just take your time and enjoy the sites all around you. God's beautiful creation is amazing! Hiking season is right around the corner! Get that camera ready and choose to get outdoors more this year! Have fun and be safe! Rain, mud, and gloomy days is what the past few weeks have looked like here in Powell County. Over the weekend we saw even more rain than normal and that lead to the streams, rivers, lakes and even our yards to flood. 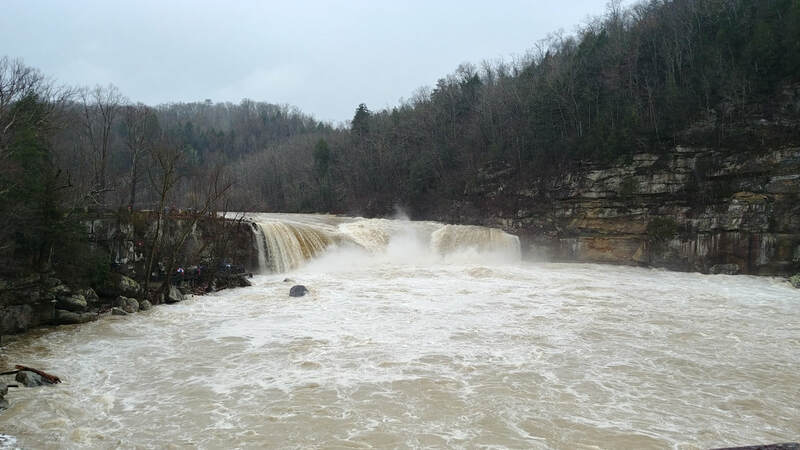 I was able to take a quick road trip down to see Cumberland Falls on Sunday. What a spectacular site to see! The power it has is absolutely awesome. 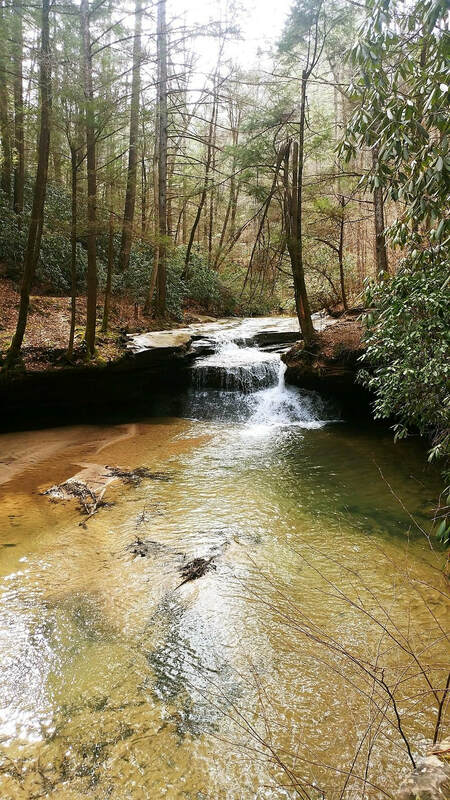 Trails will be muddy, but right now would be an excellent time to hike and see waterfalls in the gorge! 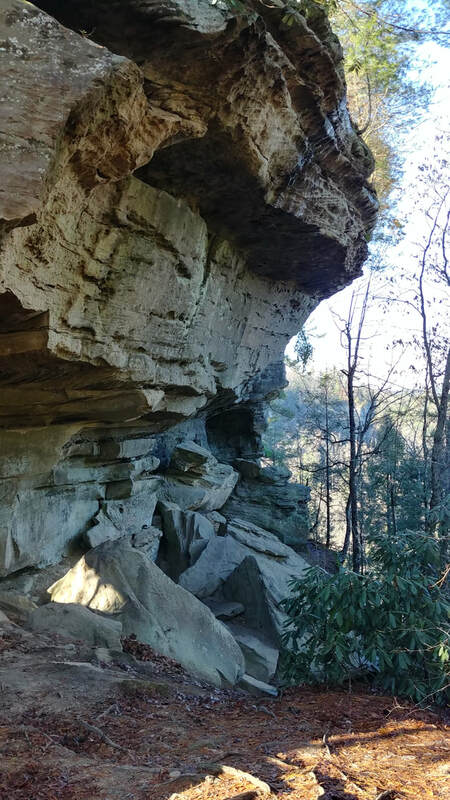 Creation Falls can be seen by taking the Rock Bridge Trail. And also the Copperas Creek Falls...which I have never been to. I'm thinking that this will be on my 'Must Hike' list for this year! Although it was fun and exciting to get out and witness all the flooding going on, we still need to be safe. So please use that brain God gave you, to decide when things are safe or not safe. And remember, sunny days are in the near future! I cannot believe it has been almost 2 months since I have been on a hike! Life has slowed back down a little bit now and when I saw the weather for this week I knew this was my chance! First thing I want to do though, is introduce you to the newest member of my family! After losing my 13 year old doggie back in August, we finally went to a rescue shelter last week and adopted a puppy. 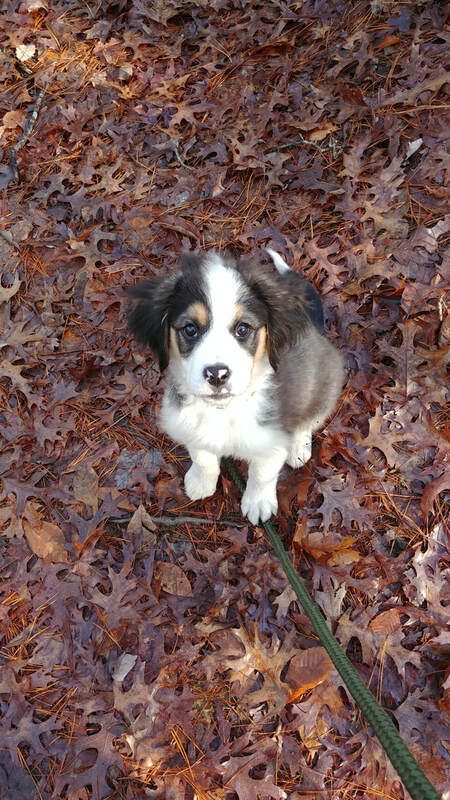 Meet Ranger y'all. This was his first of many hikes with me and he did great! I wanted a short and fairly easy trail for him and that is why I chose Whistling Arch. But don't let that stop you from hiking it. As you can see below, it's a well worn yet pretty path. The trail itself is just shy of half a mile and took me right around 20 minutes out and back. 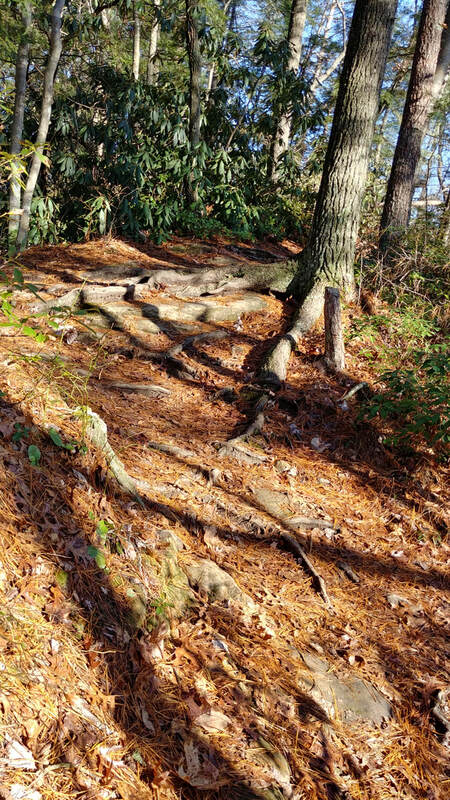 There are just a few areas where the tree roots and rocks are part of the path. Be careful of the slippery leaves in those areas. But even with all our rain, it wasn't that muddy. And I'll tell you what, if you can stand the cold, winter is an amazing time to hike. The woods are quiet and the trails are not busy at all. And you don't get near as sweaty! 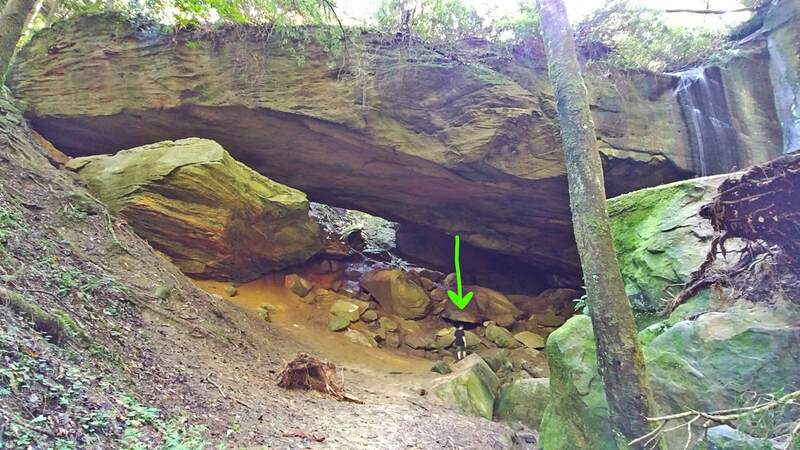 I just love the arches in the Red River Gorge! I really think I could sit and stare at the rock formations all day! 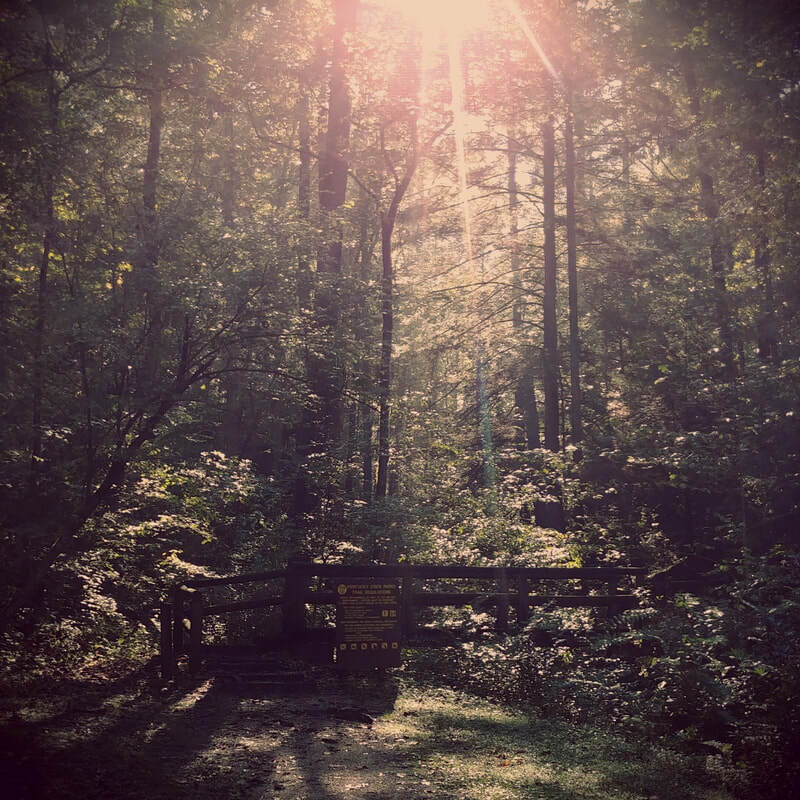 It has been years since I have hiked this trail so it was kinda new to me again. And even now, when the leaves are fallen and everything seems dull and bleak, the Gorge is still very much Gorgeous! This is a wonderful little hike. 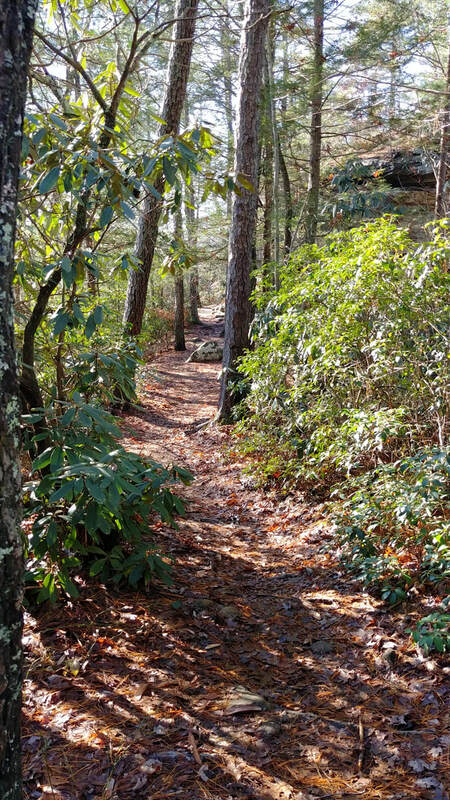 A great New Years resolution could be to get outside and take more hikes! Last year I did a 365 mile challenge. I walked, hiked, biked or kayaked at least 1 mile each day. I'm really thinking of doing that again this year. Anyone want to join me? 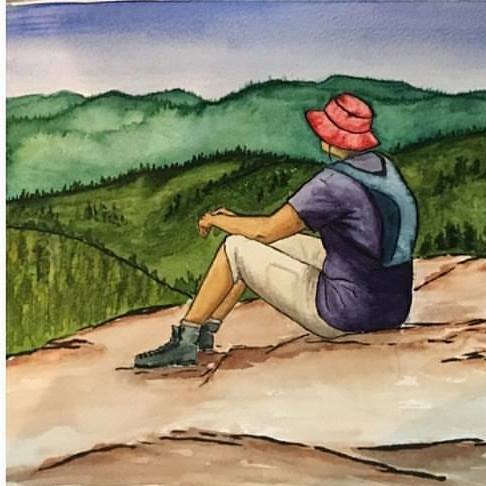 It would be great if you could share pictures of your hikes in the comments! I want to wish you all a Merry Christmas! May your new year be full of happiness and fresh air! 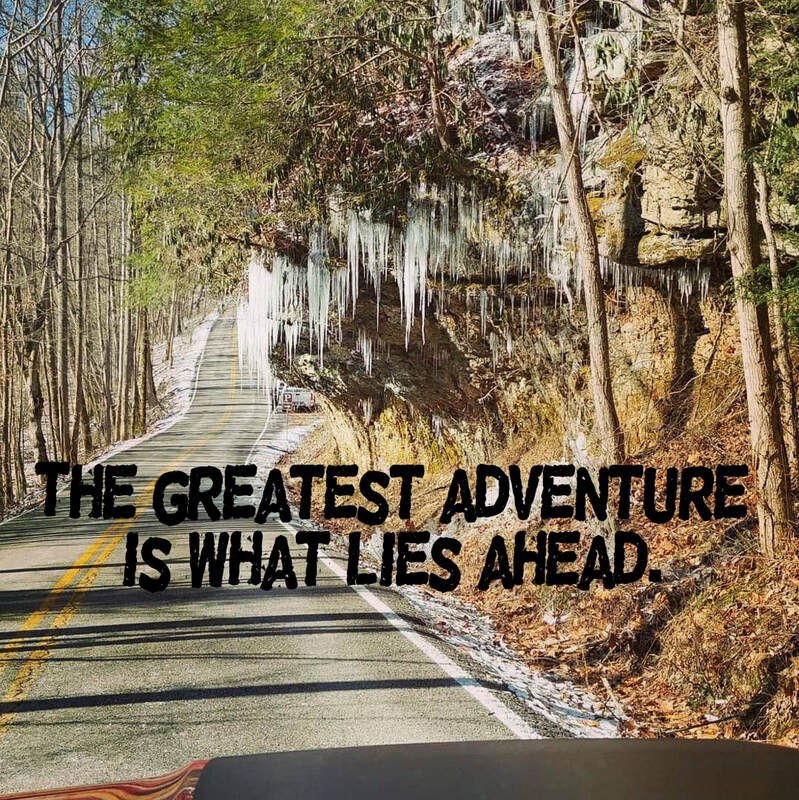 So get outdoors and take a hike! Grab that camera, have fun and be safe! It was a cool, quiet morning and I really wanted to get outside and hike, but I needed to get my flowerbeds ready for winter along with other yard work, housework and grocery shopping. So the decision was made and this was the perfect hike! Short...which means I would still have the energy to do all the above. Beautiful...it's always a bonus when there is an arch or some type of natural sight to see. Plus it is fall and the leaves are finally starting to change. This is a dirt trail that has a decline soon after you start. But it doesn't last long. The trail levels off and makes for a nice hike. I usually dread the trip back knowing it is uphill, but this wasn't bad at all. I didn't even need to stop for a breather! The designs and natural carvings in the huge boulders are fascinating to look at. Some of them are big enough to sit in! Kids, young and old, would love this trail! Don't just stop when you get to the windows, though. Walk thru and enjoy the sights on the other side! Even in doing this, my husband and I were back to our vehicle in less than 30 minutes. 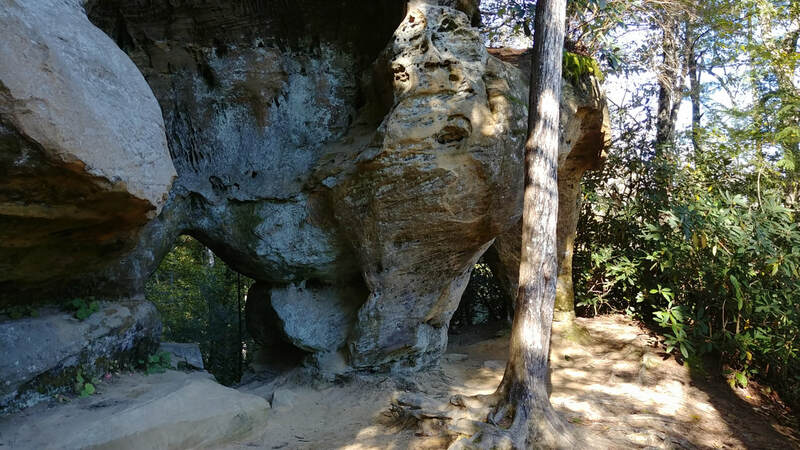 This is a marked trail in the Red River Gorge/Daniel Boone National Forest. 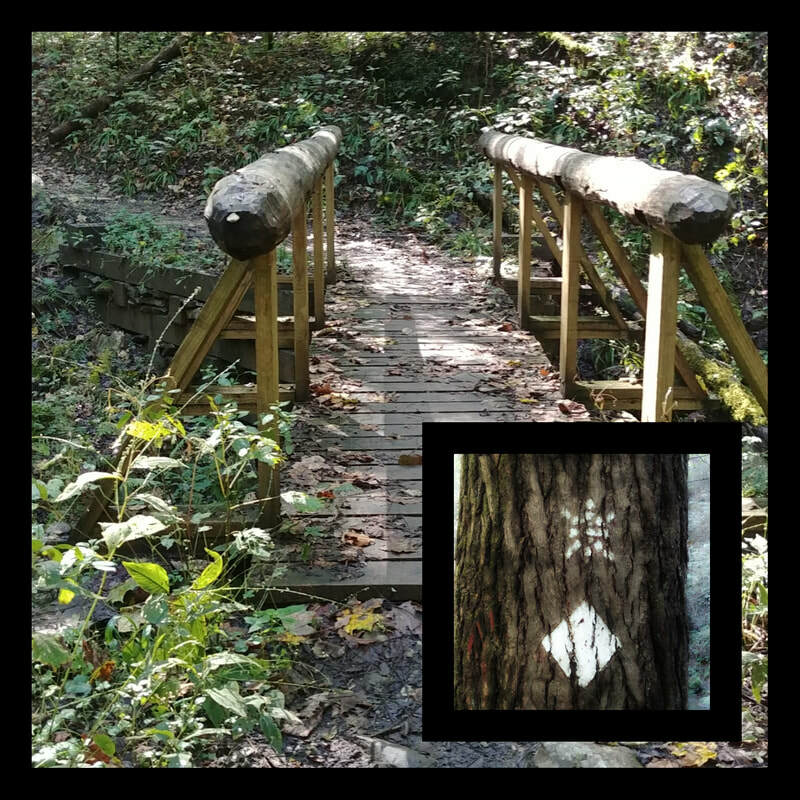 Pay attention to the white diamond marks on trees which verifies you are on the right trail. So get outdoors and take a hike! Grab that camera, have fun and be safe! It's fall, y'all!! Sky Bridge is an absolute must see during this beautiful time of year! The views are breathtaking! And if you decide to go under the bridge, you will not be disappointed! It is such a grand and stunning bridge. I had the place to myself the whole time...on the bridge, under the bridge and even on the trail. So this made for a wonderful hike and lots of pictures! Goodness, I could have stayed there all day! Especially with these cooler temps and blue skies. As you can see above, the bridge is 1/4 mile hike from the parking lot. 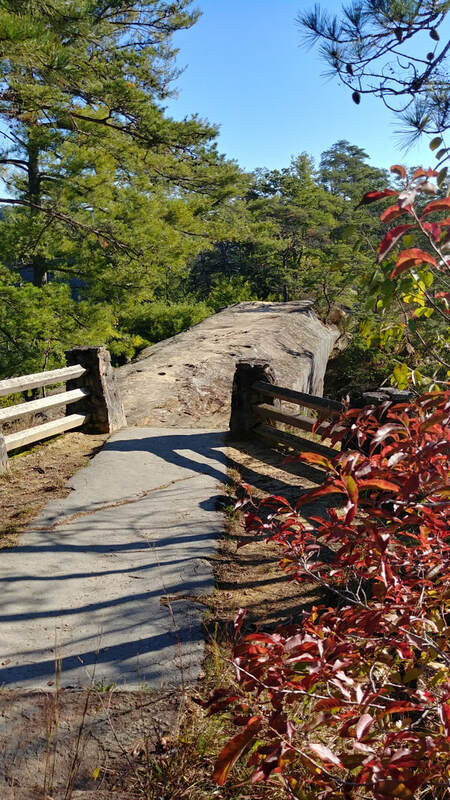 This trail brings you to the top and is paved with a few steps to get down onto the bridge, making it an easy trip. There is even a bench about half way. Take a snack, have a seat and enjoy the view for a little while. But please remember the Leave No Trace principles which include carrying out any trash you may have. To continue on the trail or if you just want to see under the bridge, which I highly recommend, you will need to cross and follow the path from there. The pavement is pretty worn and it can't make up its mind if it wants to be paved or dirt. This is also where stairs come into the hike. We are talking over 100 steps in this little 1 mile trail! And it is in the last leg that has the most. But thankfully, the forestry department built a small landing on top for us to catch our breath. Or, you can go the opposite direction starting at the parking lot and end up at the bridge. If you do this, you will be going down most of the stairs instead of up. I would have totally went this route but I was hoping to see some morning fog floating in the valleys for some cool pictures. Although I was early, it wasn't early enough. When I hike, I am taking everything in. I'm talking from watching the birds and clouds to straining to see if there is something in that little hole in the rock. 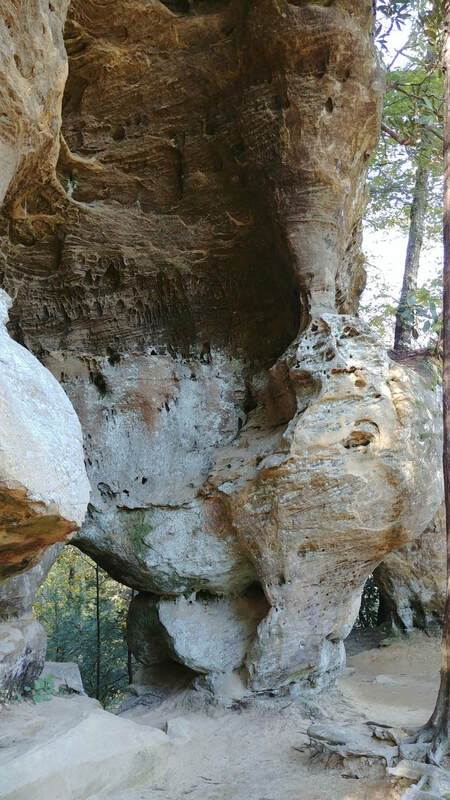 The rock wall on this trail is so fascinating with all its holes and designs. And with the leaves beginning to change it just made for a beautiful hike. Even with all my stopping, it only took me about 40 minutes. If you are in the area, you can also stop by the Gladie Visitor Center. They will gladly give you directions and answer any questions you may have. 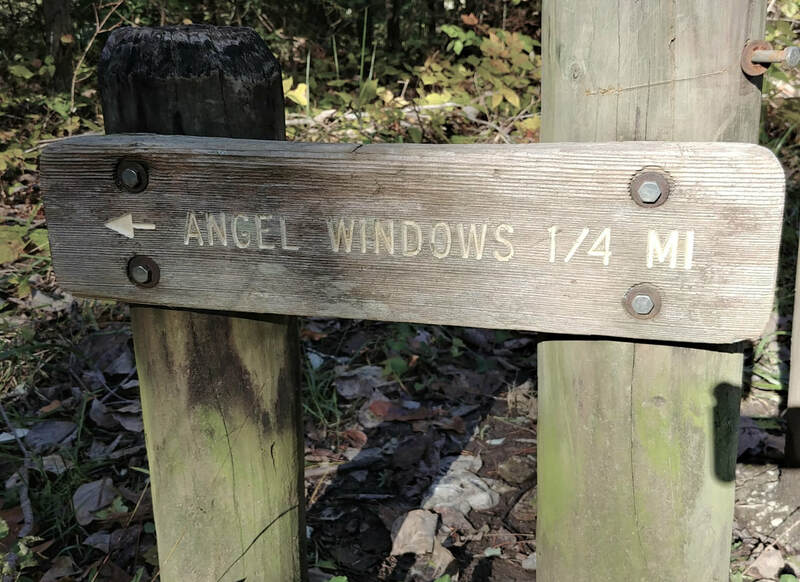 ​This trail is exactly what I think of when I imagine a nice, simple hike. It's not to short and not to long. The mature trees create a canopy overhead allowing you to be in the shade during the whole hike, out and back. And there are so many cool things to see...like the massive boulders that are covered in tree roots! There are some obstacles I wanted to bring to your attention, though. *There are a couple of decent size logs that I had to straddle to get over. These are part of the trail and to me this is fun but to others it could mean they have to turn back and not continue on with the hike. 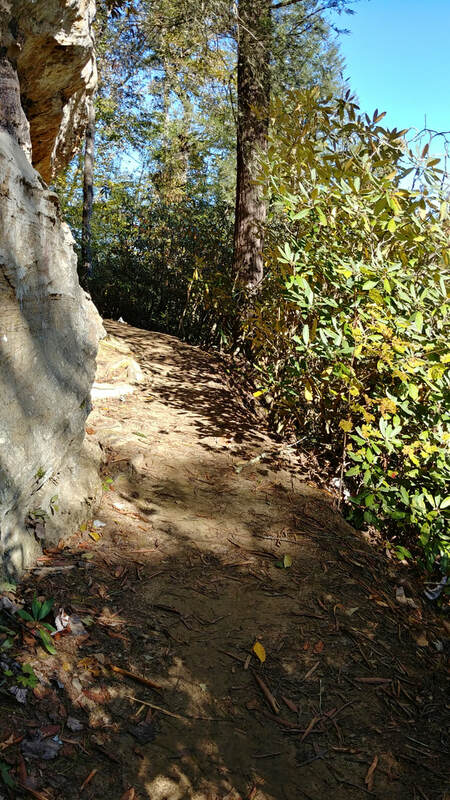 *There are a total of 12-15 steps along the trail. *The one I really want to point out is in the picture below, top right corner. It is a pipe in the ground. If the log was removed out of it, this could cause a serious injury if stepped into. So please keep an eye out for it. All of the bridges are well constructed and are holding up very good​. The one below is perfect for stopping to enjoy the babbling and burbling stream below. And since we are looking at this picture I would like to point out the trail marking. 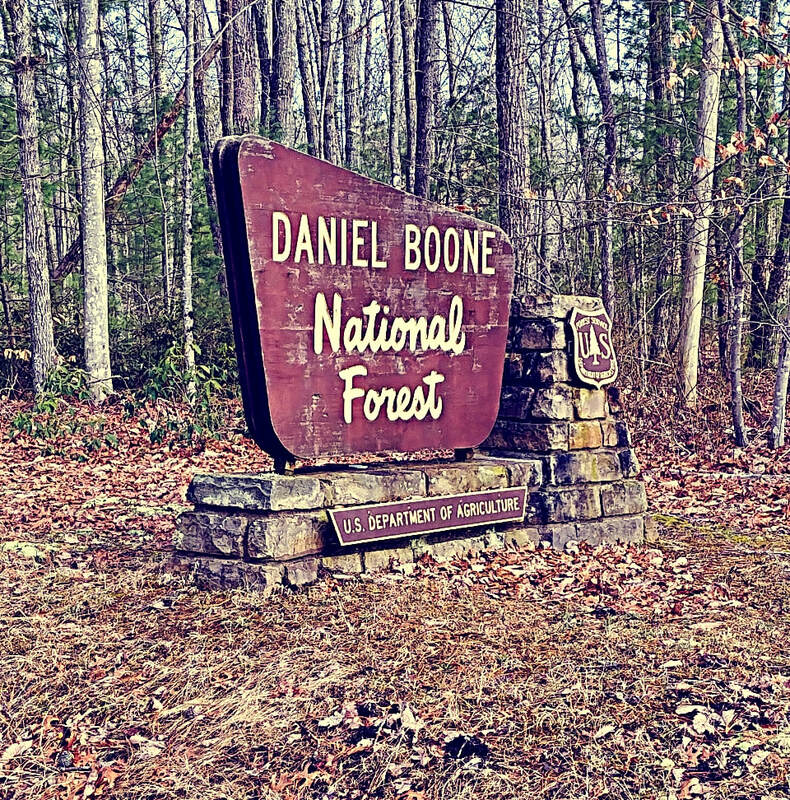 Throughout the Daniel Boone National Forest you will notice the white diamond mark painted on trees to help keep you on the right trail. Pay attention to these. When you come to a split in the trail that does not have a sign, you can normally look ahead and see one of these diamonds on a tree and know which way to go. I'm sure you have also noticed the white turtle above the diamond. For those who don't know, this is the mark for the Sheltowee Trace trail named in honor of Daniel Boone. Sheltowee is the name given to Boone by Chief Blackfish of the Shawnee tribe, meaning “Big Turtle." Pretty cool, huh? Now, back to our hike! Just you wait until you see this arch! My oldest son who is 5'11 is under that green arrow in the picture below! I was tempted not to share it, but I had to! This arch is huge! There is a waterfall off to the right and was coming down beautifully. I am sure you can go on top but I was content with just sitting on the rocks and taking it all in from there. ​So get outdoors and take a hike! Grab that camera and have fun! 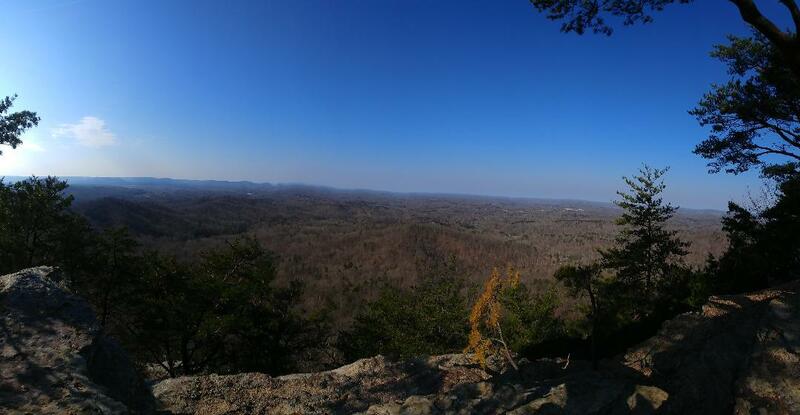 What a beautiful weekend it was to get out and hike! Cooler weather and rainy. This usually means no snakes, no mosquito's and less crowds. While I consider myself an avid hiker I will be the first to tell you that I am not in good shape! Hills and stairs and I do not get along. But this doesn't stop me from getting out and enjoying God's beautiful creation! And what better place than right here in our county! We are truly blessed. 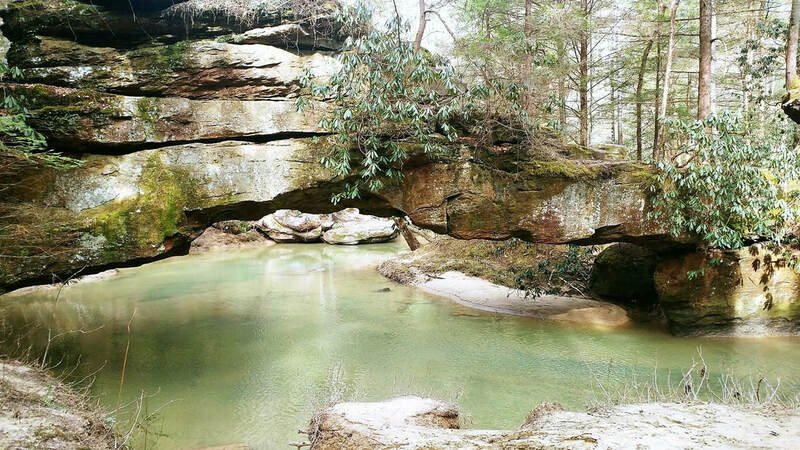 I started with the Henson's Arch Trail which is located in the Whittleton Campground. When the campground is open, you will park by the brown shed. During the off season you can park just outside the gate and walk in from there. 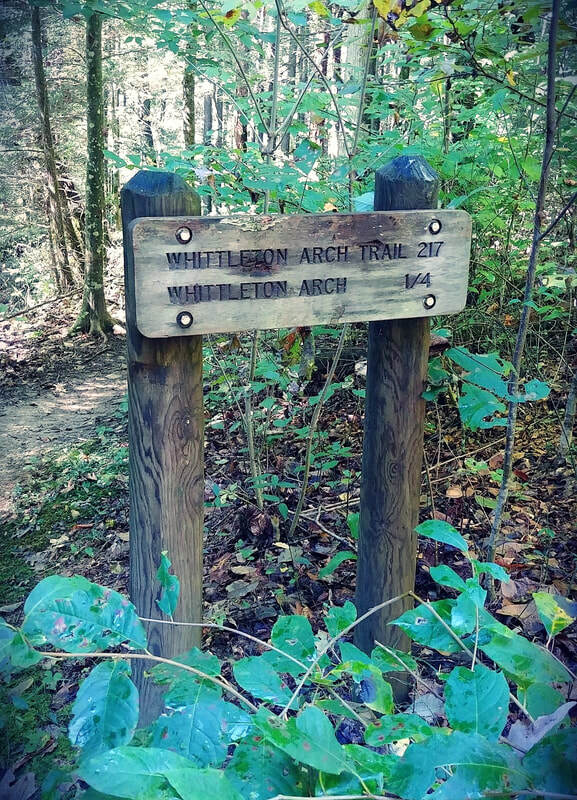 This is not the Whittleton Arch trail. Remember that. So you will need to walk toward the bathrooms and the trail-head is just behind them. 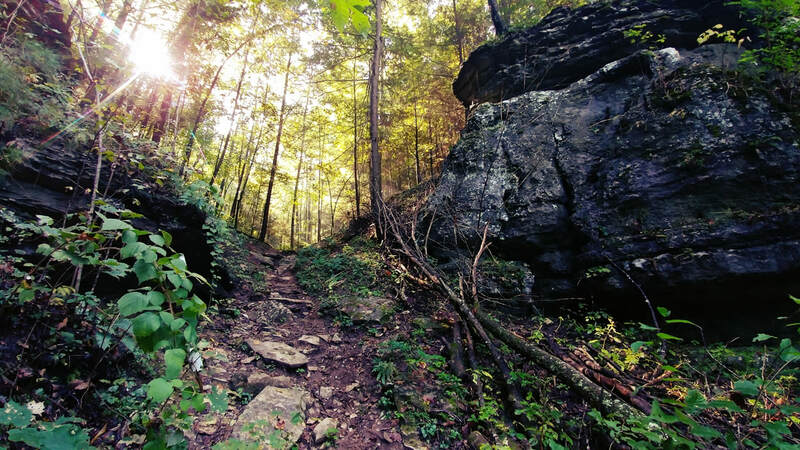 If you are needing a quick hike (and a cardio workout), this trail is perfect for you! It has a good incline along with some steps right at the start. But it soon levels off for awhile giving you time to catch your breath, which I do quite often. Today I had to walk thru water running down the path along with a lot of mud. But no big deal. That is why I wear hiking boots. 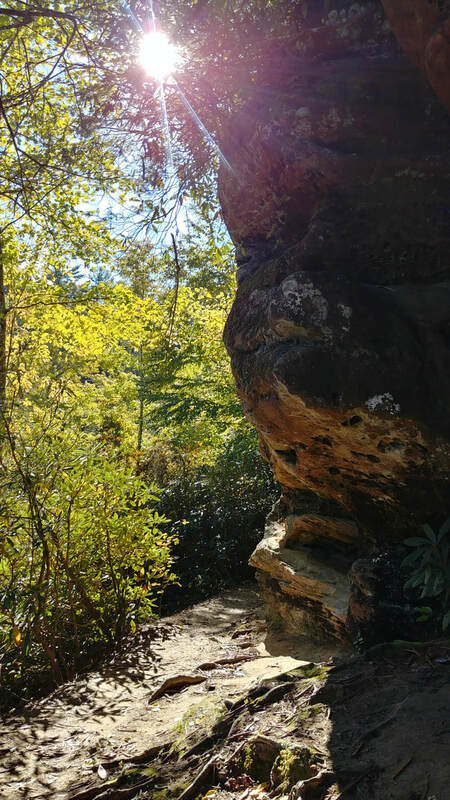 When you reach the big rock, see picture above, there is another incline. This area has decent size rocks, not little gravel pieces, you will be walking over. The good news, though, is you are now in the home stretch of the tiny arch. Yes, I said tiny, but you just have to go see it! This is truly one of my favorite places to take family and friends that come to visit because it is so cool and different! This trail ends at a hole in the ground! Crazy, right?! 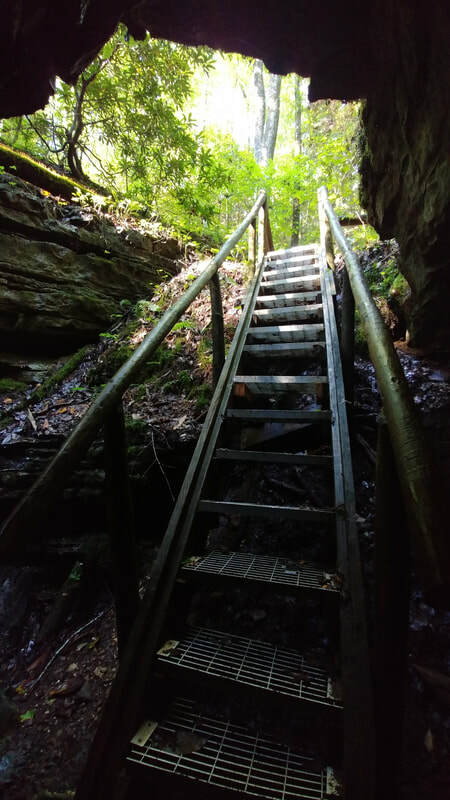 There is a steep staircase/ladder that goes down into it so you can explore this neat place. About 4 steps from the bottom you will be eye to eye with the tiny arch. 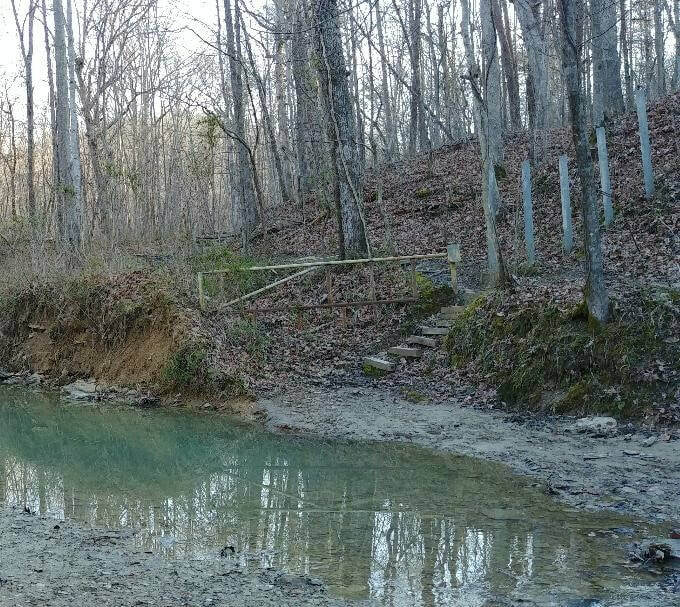 There is usually a small waterfall that flows down the limestone wall along with a tree that fell in sometime ago. Take time to walk around and explore a little. Find where the water from the falls goes. Take pictures. And most importantly, have fun!